"The Jewel in the Majestic Crown" can be the only reasonable way to describe the sweeping views commanded by Villa Cole. This privately gated 5 bedroom, 4 1/2 bathroom villa will redefine your vision of a luxury vacation home. With her vaulted and cathedral ceilings, flowing stairway, and walls of glass your palace on top of the mountain is guaranteed to please the most discerning traveler. Simply the most superb views of the Gulf of Papagayo and Ricon de la Vieja National Park will be vibrantly etched in your memory, tantalizing your desire to return to "Pura Vida". Villa Cole is well over 4200 sq ft. of thoughtful design. Her spacious grandeur will be the perfect backdrop for your incredible Costa Rican vacation! Located in the coveted gated community of Monte Paraiso, in Playa Hermosa, Guanacaste, Casa Cole is perfectly sitting on 3/4 acre at the top of the hill. She commands the most beautiful views of the Pacific Ocean imaginable. Take in the warmth of the sun from the large terrace. Relax on one of the 3 covered patios, or take a swim in the infinity edged Jacuzzi pool while at the same time you are mesmerized by the vast stunning view. A new definition of multitasking, the Pura Vida way! Menander around the beautiful landscaped grounds, with the flora of Costa Rica abound. Discover the large covered balcony that is a destination all to it's own.. A favorite spot to watch the sunset. Enjoy the flocks of colorful birds that soar in unison around the area. Be amazed by the iguanas. Hear the call of the Howler monkeys. Enjoy the ever changing hues of the skyline at sunset. Listen closely for the breaking waves while you experience the most incredible star gazing at nightfall. As you experience Villa Cole's tantalizing charm, You will agree, she is indeed, "one of the most memorable houses from around the world". The villa can be rented alone or with the option of an additional 2 bedroom, 2 bath home Casita Cole (192423) with its own stunning ocean view and private infinity pool, all behind the 3/4 acre property of the Villa Cole Estate. The Zindis Group Property Management company is locally based here in Playa Hermosa. Our goal s been and will always be to strive to protect and enhance the quality of the properties we rent to our clients have an unforgettable holiday. 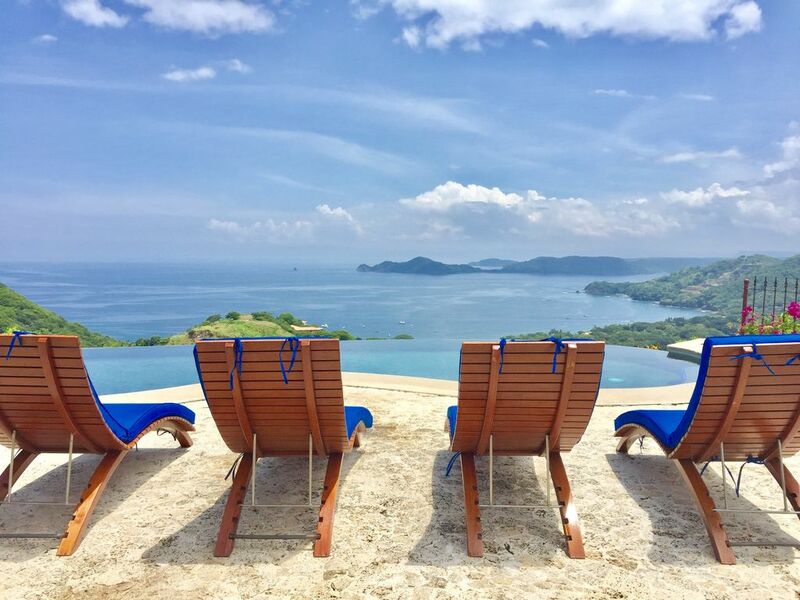 The exquisite location On Top of the World above Playa Hermosa, Guanacaste Breathtaking panoramic views of the Pacific Ocean, Papagayo Peninsula. Cacao, Orosi, and Rincon Volcanoes, Santa Rosa And Rincon de la Vieza National Parks on the horizon. Infinity edged Jacuzzi pool with large sundeck Ocean View Gourmet Kitchen 3 covered patios for shade Large Balcony 4 ocean view bed rooms and one mountain view bedroom Relax on one of the 3 covered patios Located in a gorgeous secure community with 24 hour security. Meticulously landscaped private gardens Located a mere 20 minutes drive from the Liberia Airport. In just minutes you are on one of Costa Rica's most beautiful 'Blue Flag' beaches. Every conceivable water activity is at your doorstep. 5 Minutes to Playa Hermosa 10 Minutes to Playas del Coco 3/4 Acre privately gated estate within a gated exclusive neighborhood Being surrounded by the beautiful scenery of flora and fauna that Costa Rica has to offer, especially the iguanas, monkeys, butterflies, parrots and other colorful birds that call this area home. Have your own compound with the option of an additional fully equipped 2bedroom 2bath 1400 sq ft home (property # 192423) with it's own pool and incredible ocean views. Both rentals bring the total estate to 7 bedrooms 6.5 baths, 2 pools, 2 full kitchens, 2 laundry rooms, with views that go on forever, plenty of public and private space for everyone, within a 3/4 acre fully landscaped gated property, all sitting on Top Of The World above the coveted, award winning, blue flag beach, Playa Hermosa in Guanacaste! WOW! 20 minutes from the Liberia International Airport 15 minutes from the Cima Private Hospital Three national parks are within a one hour drive; rainforests, volcanoes, wildlife refuge, secluded beaches and hidden waterfalls will keep your days full of activities. Restaurants, bars and casinos will occupy your nights. Playa Hermosa has long been known as one of the most prestigious beach communities on the Gulf of Papagayo. Playa Hermosa, one of the calmest beaches in Costa Rica. Awarded the Blue Zone for its cleanliness. Shade trees and plenty of bars and restaurants along the beach. Free local calls and free International calls to the US and Canada. Beautiful bright library with ocean views and a wonderful selection of reading material. Connecting balconies from the upper bedrooms leading to dazzling sunsets and skies. Are available for hire locally. 25 minutes away is the Four Season's Golf course Designed by Arnold Palmer, features an18-hole, par-72 championship golf course. Located only 20 minutes from Liberia International Airport, this property is well situated for those seeking adventure while appreciating the pleasure and convenience of luxury accommodations. Minutes off our beach is arguably the best deep-sea fishing in the world, Witch's Rock's renowned waves are 25 min away by boat, Experience the local fishing village of Playas del Coco with local handicrafts and a multitude of bars and restaurants. Liberia (30 min.) Brilliant hiking, hot springs,mud holes, waterfalls, remote beaches and more .We are an hour’s drive from Santa Rosa National Park and Rincon De La Vieja National Park. Tropical scenery and gorgeous views abound in Costa Rica. A drive east takes you to Monteverde's Cloud Forests and Vulcan de Arenal in just in 2.5 hrs. Loved the house. Steep drive up but the perfect view is worth it! Beautiful spot. View like no other. Our family of 6 visited Casa Cole. One of the most spectacular spots we’ve ever been. Well stocked kitchen, comfortable beds, plenty of space, refreshing pool - but the view overlooking the pacific was absolutely stunning. It just never got old sitting on the deck admiring the beautiful coast line. Wonderful stay, location, and hospitality. Our party of 8 LOVED this house! At times we had up to 12 people here having dinner and there was plenty of space. We truly loved the view each morning, the layout was perfect (open floor plan), and the service of Zindis was top notch. We even had monkeys in our trees in the back yard. Seriously, just an incredible location and the pictures DO NOT do the views justice. Be prepared to be blown away. We will be back for sure! Place was everything we imagined and more. Absolutely beautiful views from pool! House was very well stocked with everything we needed to enjoy our time there. Plenty of dishes, pots, pans and great grill. Also an abundance of beach supplies, towels, mats, chairs and even coolers. House is exceptionally maintained and our host was amazing, checking in on us each day. Will definitely book this place again next year! If you are looking for a first class, top notch vacation rental look no further. In my mind there is no villa that can match this one. The view takes your breath away, it is mesmerizing. The villa was stunning, linens luxurious, well maintained and extremely clean plus the air conditioning worked!!!!!!!!!! The property management personnel are professional and will look after all your needs. I didn't think this rental would exceed my expectations, which were already high, but it did. Everyone in my family of eight fell in love with this vacation rental and all agreed it was a very sad day when we had to leave. The home was beautiful and spacious. Very clean and ready for our arrival. We had one small issue with the battery failing for gate access, but this was promptly resolved first thing in the morning. Explored by horseback, foot, kayak or SUP, all trails lead to waterfalls, misty crater lakes or jungle-fringed, deserted beaches… Try zip lining, canopy tours, hiking, and surfing. Costa Rica’s adventures are all top notch and are all waiting for you. Playa Hermosa, Playa Panama, And Playas Del Coco are great places to be based out of. Playa Hermosa has one of the safest and calmest beaches in Costa Rica. In these beach towns, you will find and ample amount of restaurants and sodas plus grocery store’s and a few pharmacies. A soda is a small Costa Rican family run restaurant with fresh home cooked food at reasonable prices. South of Playas Del Coco there are some wonderful beaches to explore for day trips. Playa Conchal, Playa Flamingo, Playa Portrero, and Playa Dante are favorites. Tamarindo and Playa Grand are about 1.5 hours south. These two beaches are wonderful for surfing. A bit further afield is the Arenal La Fortuna area. It is about a three hour drive Playa Hermosa. At 5,437 feet, the Arenal Volcano looms large and ominous over the pastured green hillsides that surround its base. Although currently in a resting phase, Arenal remained the country’s most active volcano for the past 43 years. Simply put, Arenal is striking. It is a picture-perfect volcano which dominates the horizon, while rivers and waterfalls tumble through the rainforest that spreads across its base. To the south, the massive Lake Arenal stands sentry to the Tilarán Mountain Range, whose jagged green spine extends along Costa Rica’s central highlands. From Arenal you can travel to the cloud forest of Monteverde – a nature lover's paradise. The town of Monteverde is fairly small with shopping and some great restaurants Enjoy a nature hike in the Santa Elena Cloud Forest Reserve then opt to visit a butterfly garden, zipline through the canopy, or go horseback riding. Take advantage from our local concierge’s knowledge of the country and come soak up the sun. What are you waiting for? Rates are subject to change until booking is confirmed. Quote lifespan- 48 hours After a request payment is made travelers have 48 hours to respond until the quote expires. - 25 Minutes from the Daniel Uber International Airport (LIR) - A 7 night stay is required from Dec 16, 2017- January 3, 2018. - Guests checking in after 5PM - 9PM a $35.00 late check in fee will apply. -Guests checking in after 9PM a $50.00 late fee will apply. This fee will be collected upon check in and payable in USD or Costa Rican Colonies. -A gentle reminder that you are staying in a privately-owned home and we respectfully request that you treat it with respect, including all furnishings and linens. -All homes are smoke and pet free. This home can also be rented with the 2 bedroom, 2 bath Casita which also has full kitchen and pool. Refer to property #192423 to view details about the Casita.